As Canada continues to battle an ongoing financial crisis, new research from Mintel indicates that some consumers are indeed facing hard times, as more than one third (34 percent) of consumers report that they are underbanked* (28 percent) or unbanked** (6 percent). What’s more, 58 percent of Canadians agree that the government should do more to protect the financially vulnerable during a stretch*** in which nearly one in five (17 percent) consumers have used an alternative financial provider. These alternative providers, such as cash advance, cheque cashing services and payday lenders, are more likely to be used by the unbanked (34 percent). When examining Canada’s unbanked consumers, 13 percent say they do not own a bank account because they have insufficient funds to open one, while a similar percentage do not have an account because they prefer to keep cash at home (14 percent) or have security concerns (13 percent) with banks. While more than one third (35 percent) of unbanked consumers plan to open a bank account in the future, the unbanked represent the most likely group to be open to peer-to-peer lending (24 percent vs 14 percent of consumers overall). As consumers continue to feel the effects of the economic crisis, their financial priorities reflect a desire to weather the current storm. In fact, the top financial priority for Canadian consumers is to pay off credit card balances (28 percent), followed by reducing credit card debt (22 percent). What’s more, one quarter (24 percent) of consumers prioritize building an emergency savings account for those rainy days ahead. With two in five (38 percent) consumers agreeing that they are uncomfortable with the amount of debt they currently have, long-term financial planning is also a priority: 26 percent of consumers say it’s important to contribute to a retirement account. Additionally, 17 percent of Canadian parents say opening an account for their children’s education savings is a financial priority. 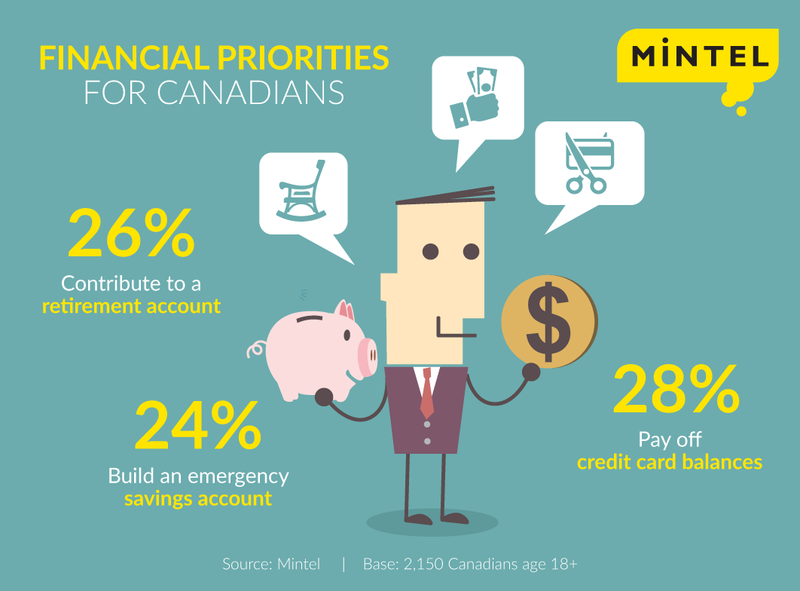 Mintel research reveals that Canadians are optimistic about their finances with the majority (56 percent) agreeing that their financial situation will improve in the near future, including half (50 percent) of unbanked consumers. As they look to improve their financial situation, 55 percent of consumers take time to look for the best deals related to financial products and services, while one third (34 percent) would like more guidance on managing their personal finances. “Canadians are weathering tough economic conditions and remain optimistic, as many believe their financial situation is bound to improve. Consumers remain dedicated to short-term financial priorities, but are also planning for the future. With the majority of consumers looking for ways to save money on financial products and services, banks would do well to highlight how they support consumers with flexible offerings such as no-fee banking, while also catering to consumers’ long-term financial goals by communicating options like high-interest savings accounts,” concluded Sharma. * “Underbanked” refers to consumers who do not have either a chequing or savings account, only have a chequing account or who have used an alternative financial provider. ** “Unbanked” refers to consumers who do not have both chequing and savings accounts. *** Three years ending November 2015. Press copies of The Underbanked Canada 2016 and interviews with Sanjay Sharma, Senior Financial Services Analyst, are available on request from the press office.